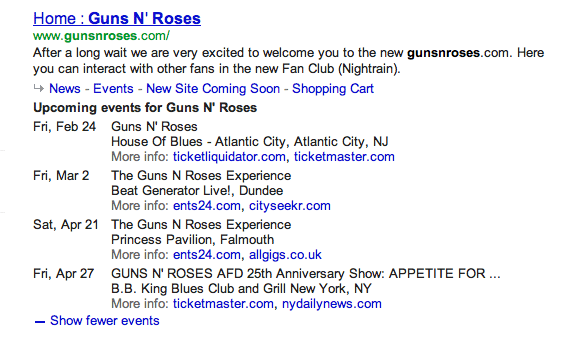 Just about a month ago, we reported seeing concert rich snippets on 3rd party sites. Meaning, the snippets under the search listing shows rich snippet data not from that site listed but from a 3rd party site selling tickets for that band. Google has announced this feature last night, stating "now when you search for bands or artists, you may see upcoming concert tour dates right on the results page if they're playing in your area." The most interesting part of this is that this is an excellent way to get number one rankings for your site without having the number one ranking. Just piggy pack on the band's name and hope and pray that Google lists your site as a seller of tickets for the band. If you have a website listing upcoming events and would like them to appear in search, you should add rich snippets markup to your web pages. After following the instructions to mark up your events, use the rich snippets testing tool to test your markup and see how it would appear on Google.